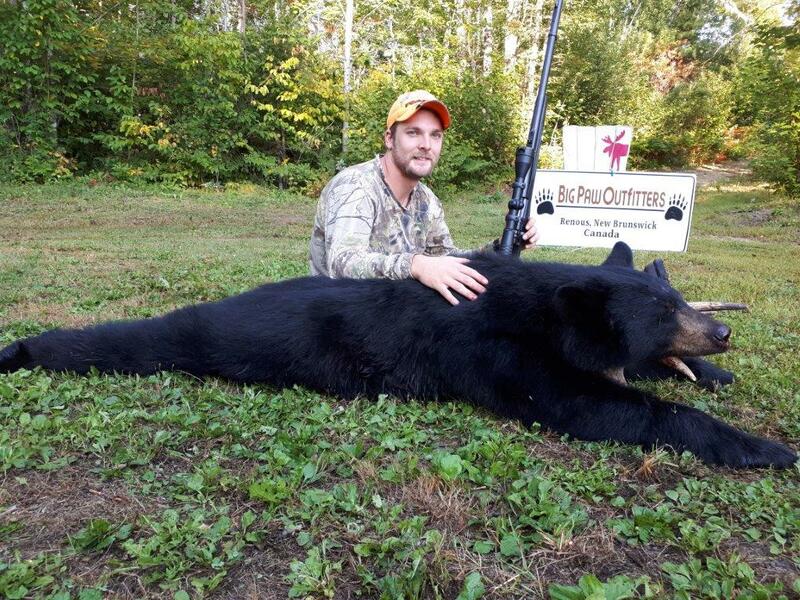 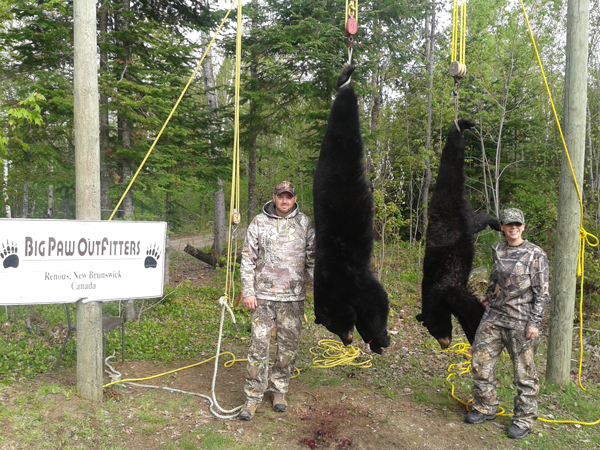 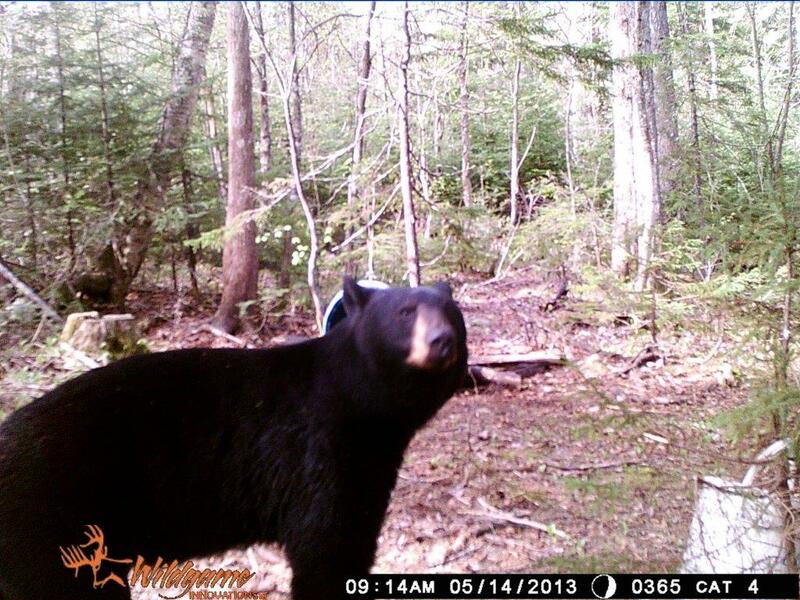 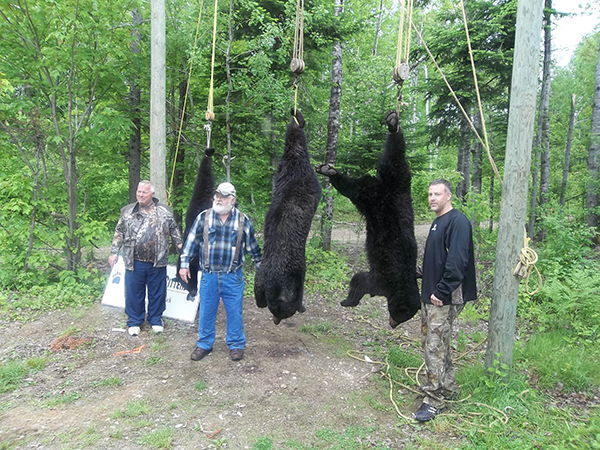 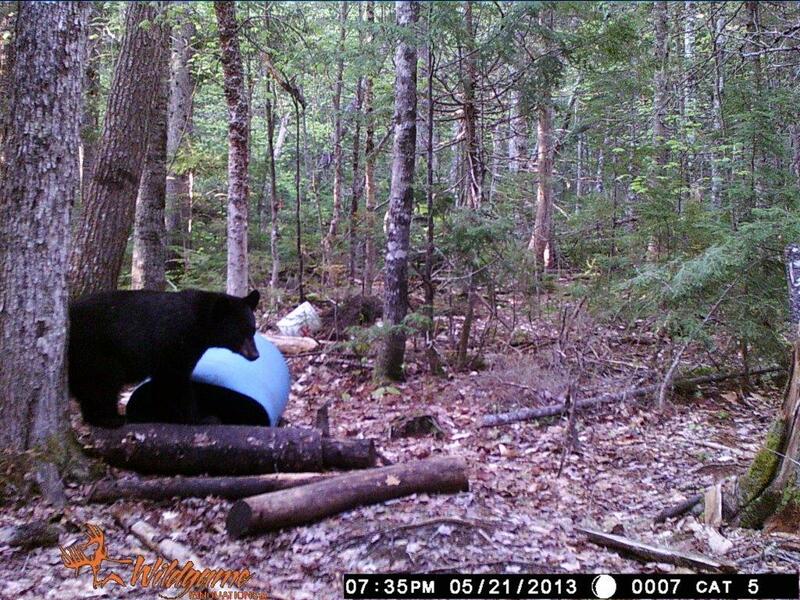 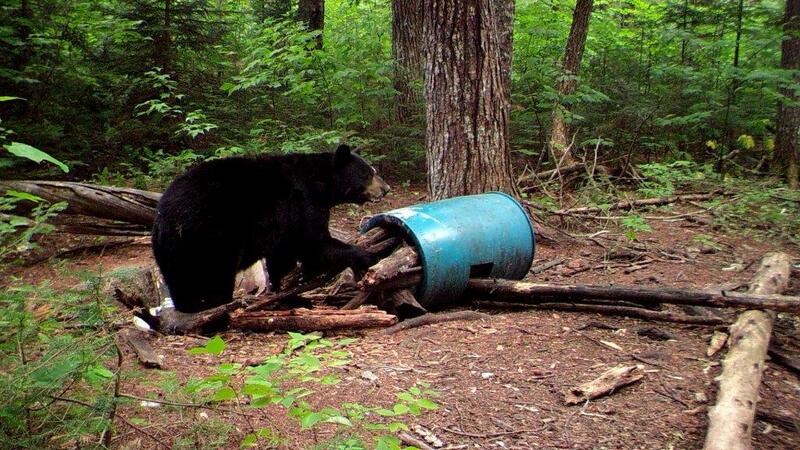 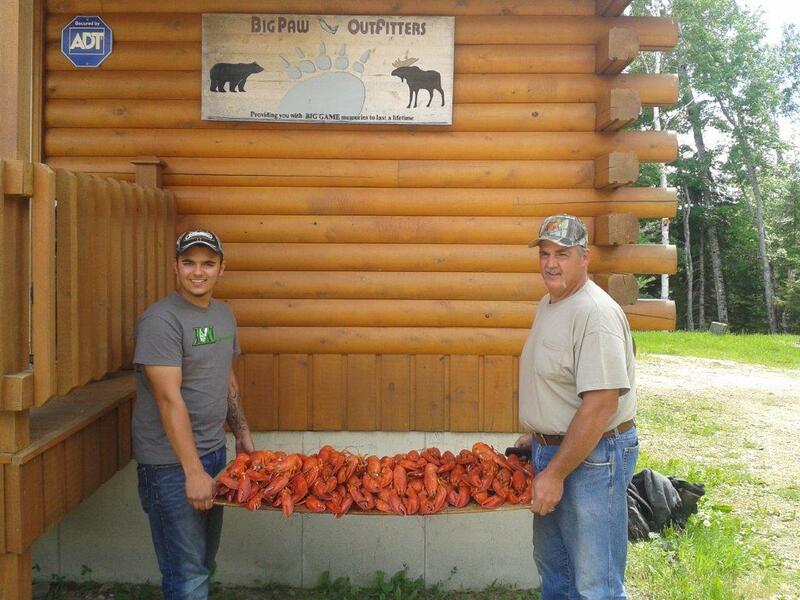 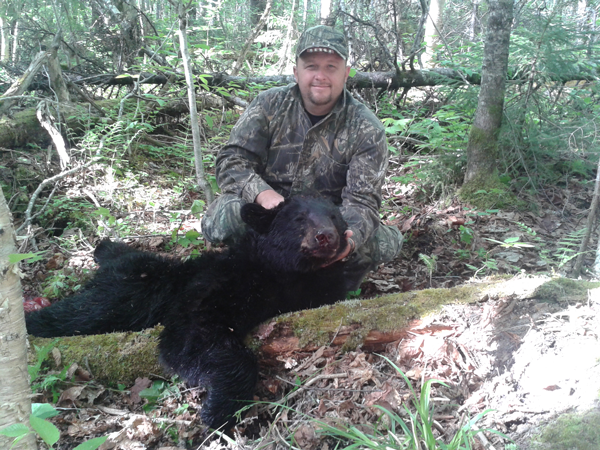 We offer 5 day black bear hunts starting Monday and ending Friday evening. 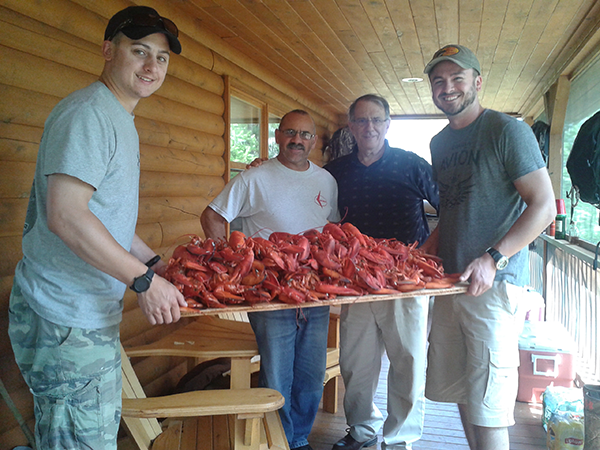 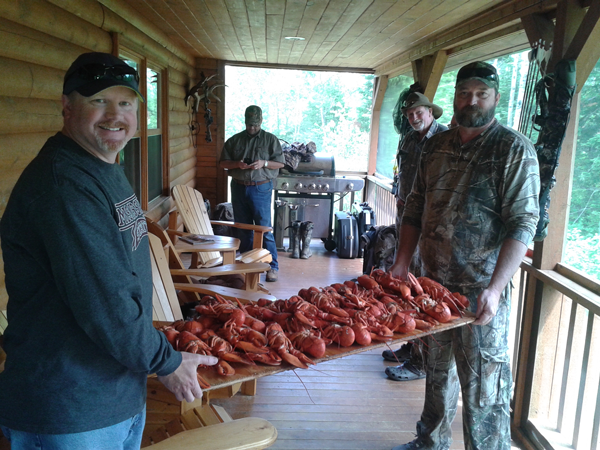 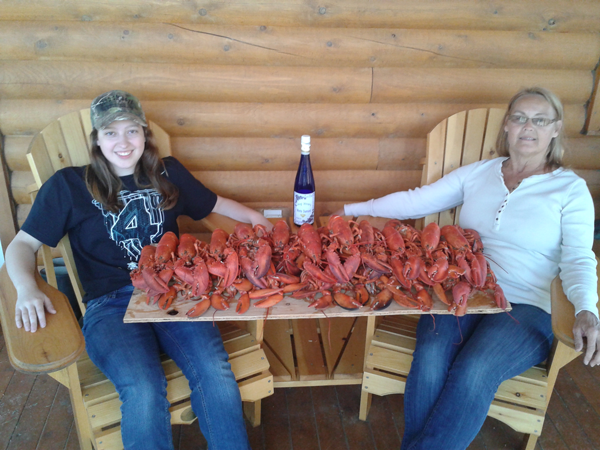 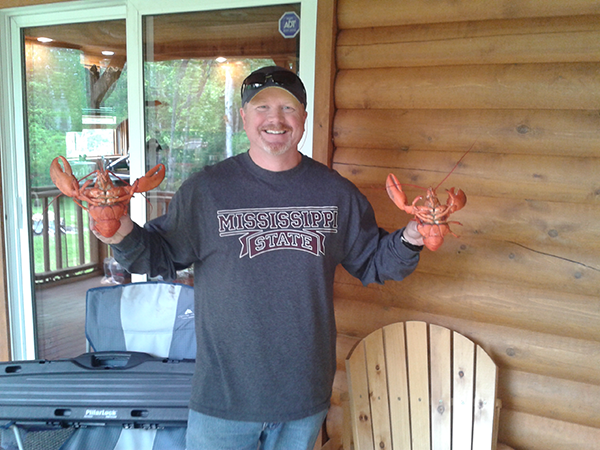 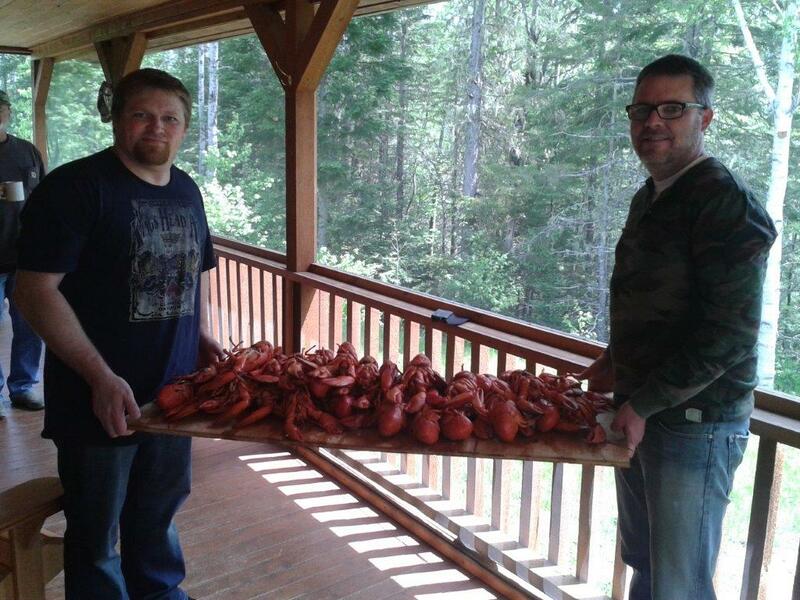 You would be welcome to arrive at our hunting lodge Sunday before the hunt until the following Saturday morning (5 day hunt and 6 night stay). 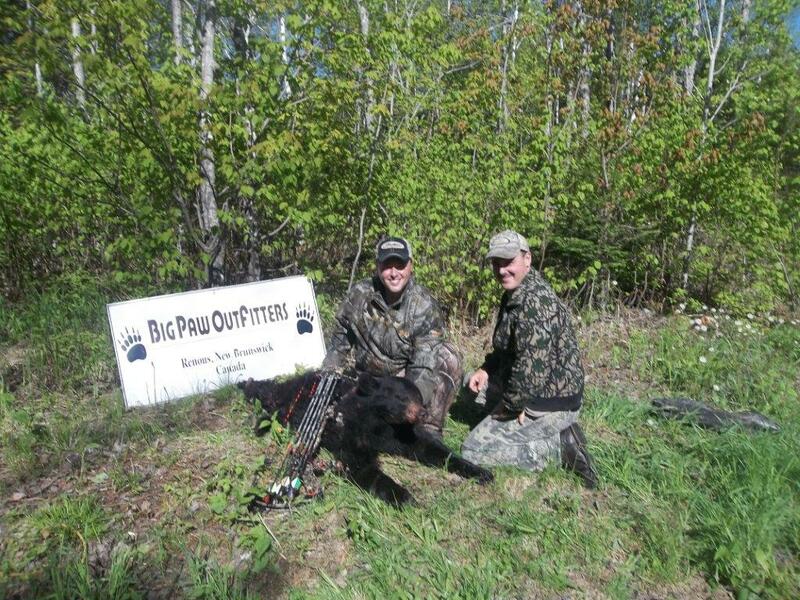 All hunts occur over a guaranteed active bait site. 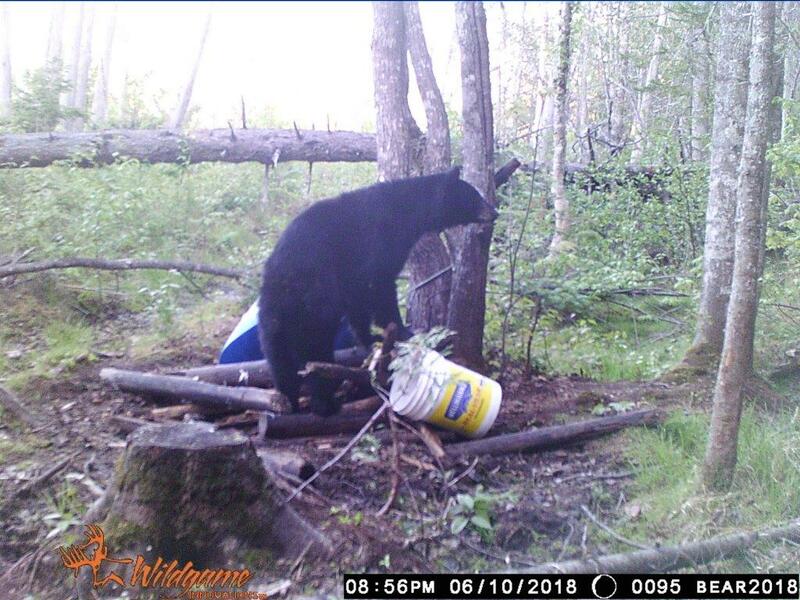 Most baits have large permanent tree stands. 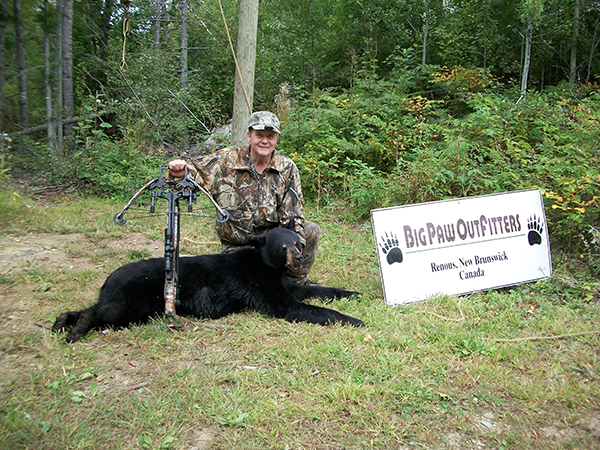 Portable tree stands are also used as well as ground blinds. 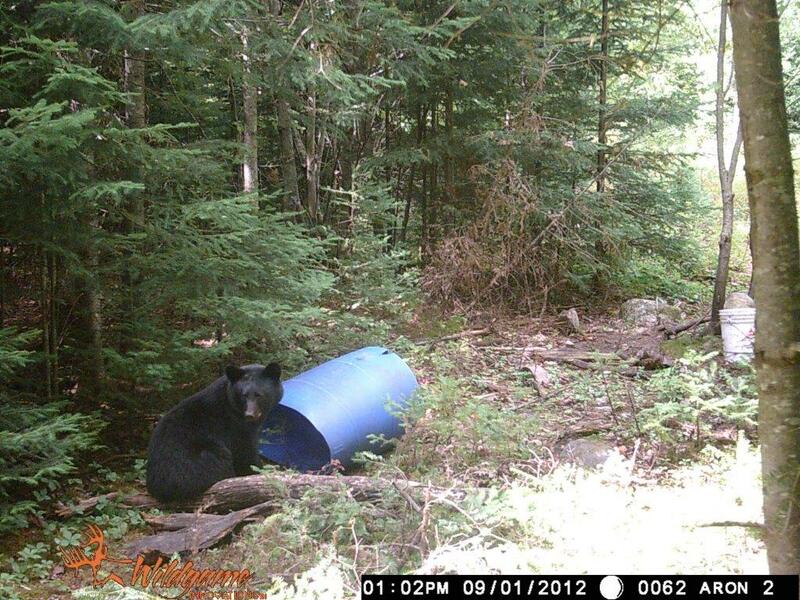 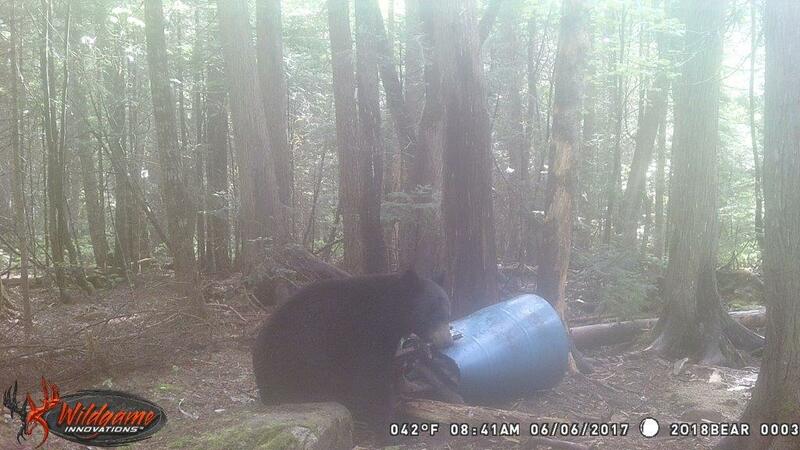 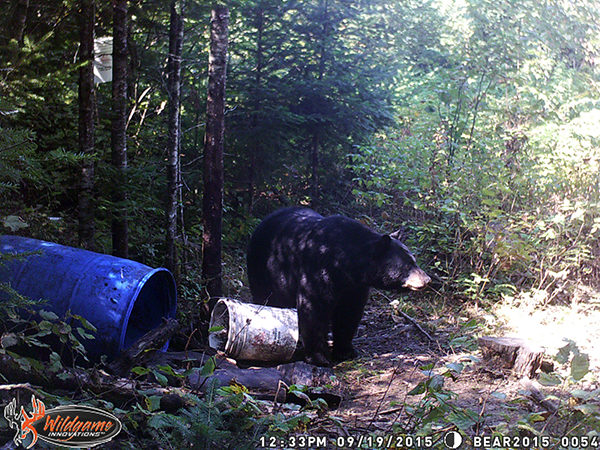 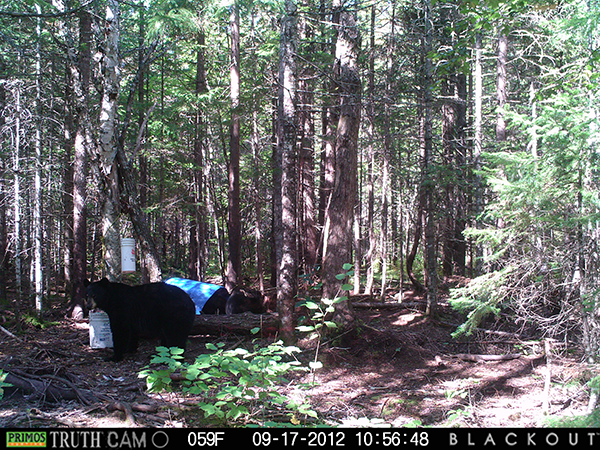 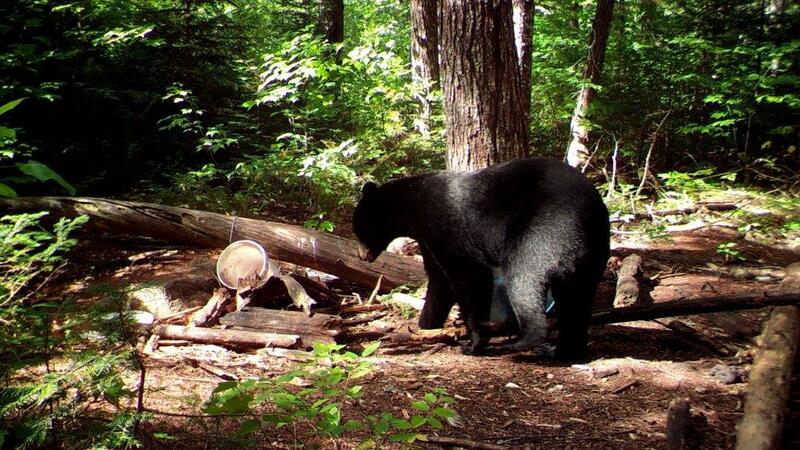 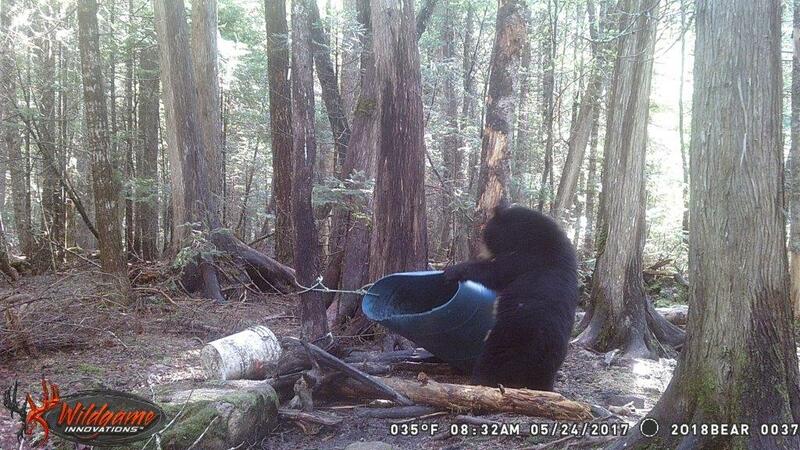 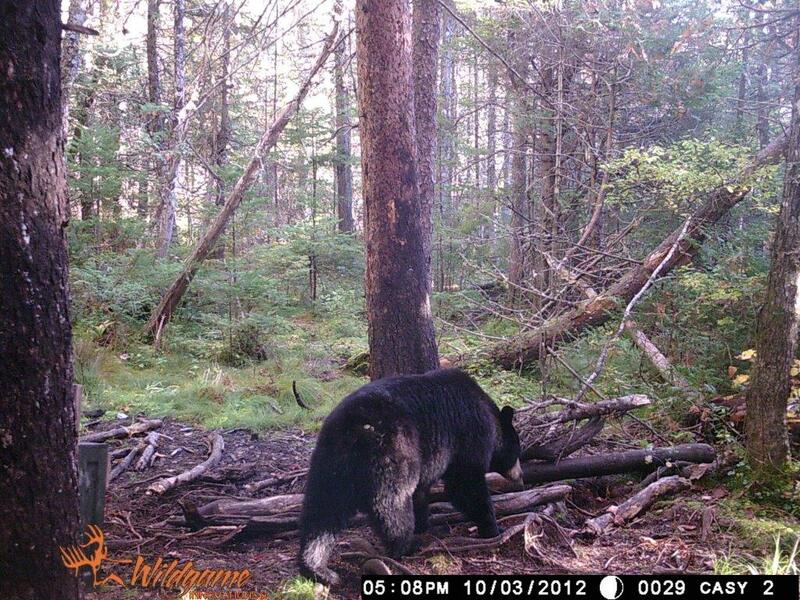 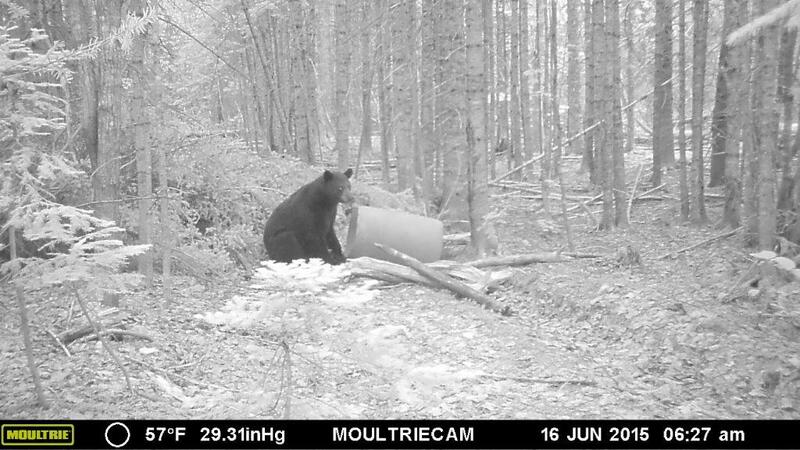 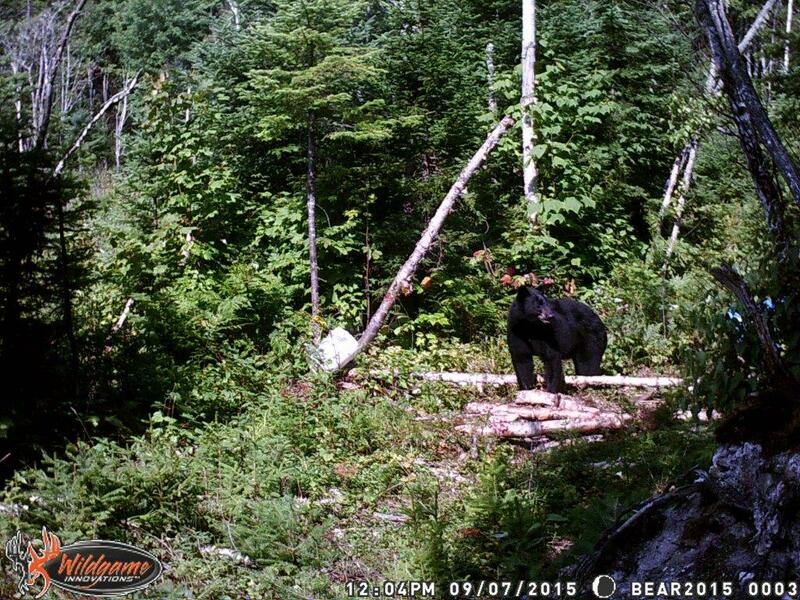 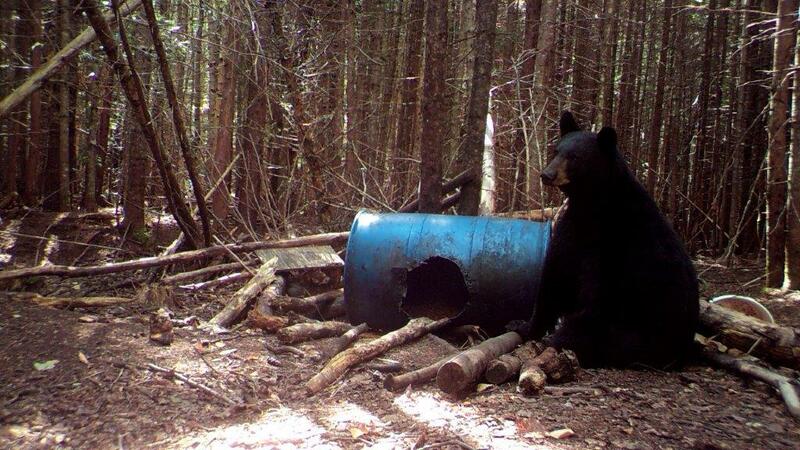 All baits are trail timed to determine peak activity and increasing the amount of bears seen per hunter. 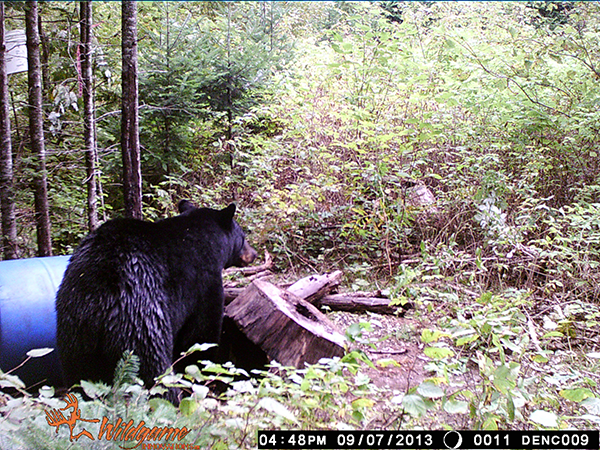 Most stands are not more than 20 yards from the bait, allowing close examination of your quarry. 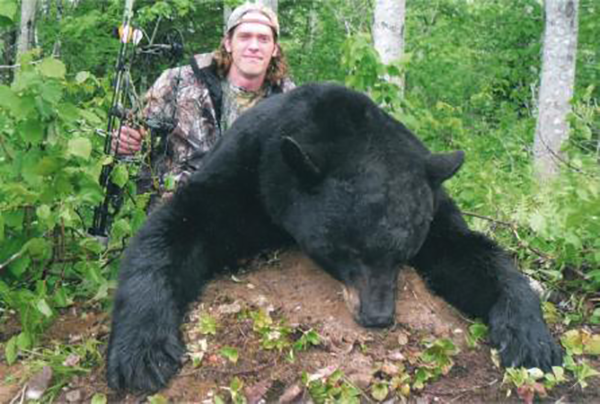 On a typical day one would expect to hunt late afternoon until one half hour after sunset. 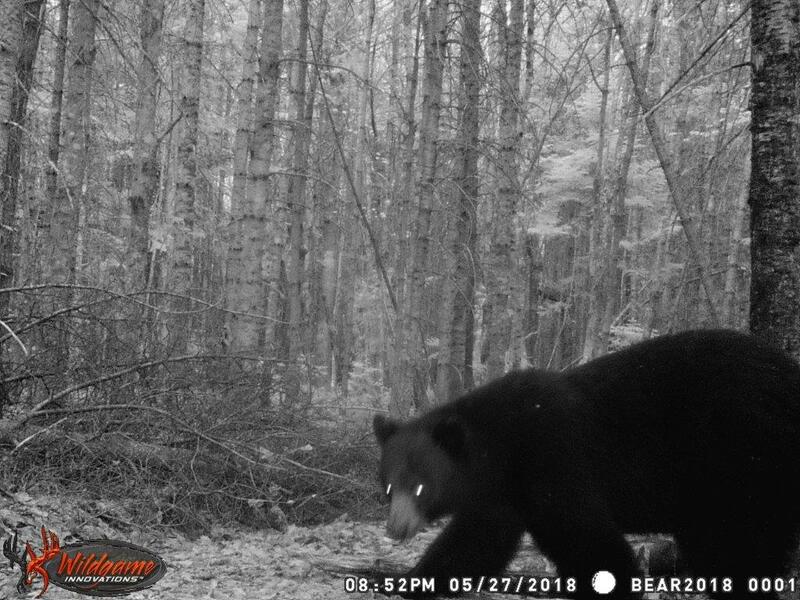 Your guide will assist you with getting set up in your stand after a short drive of no more than 20 minutes from the camp. 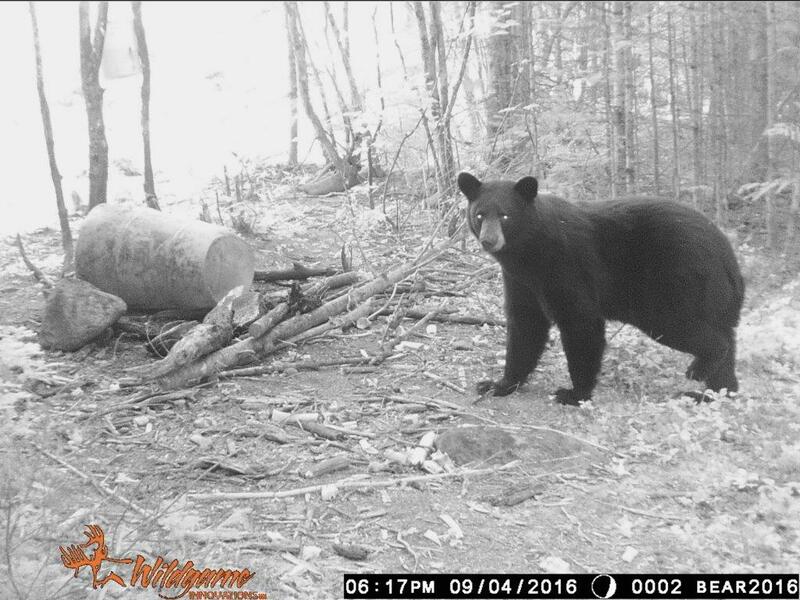 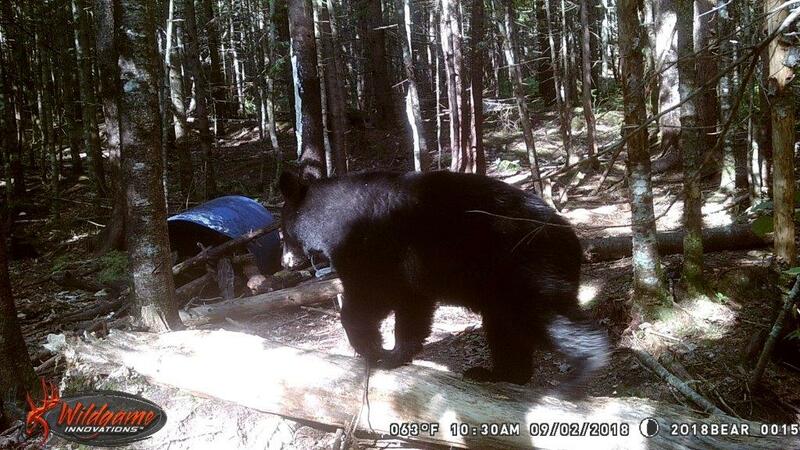 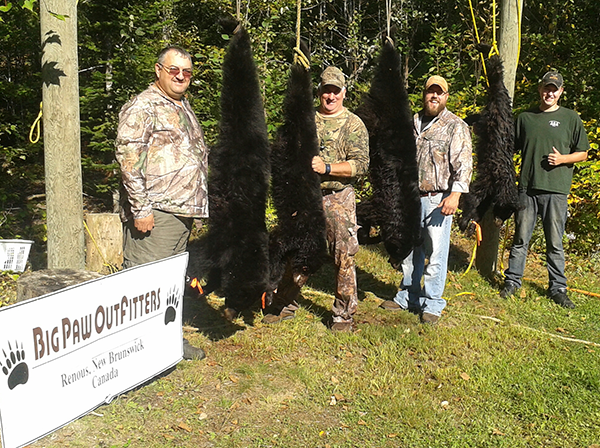 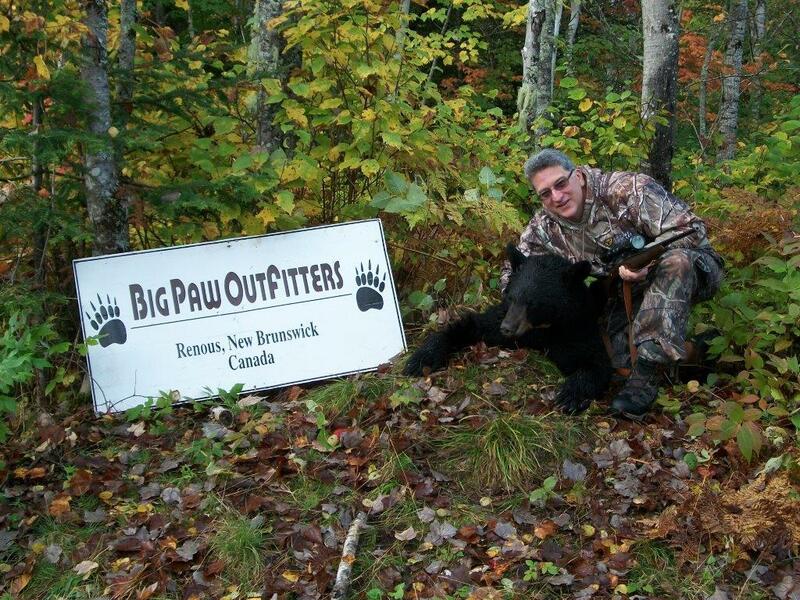 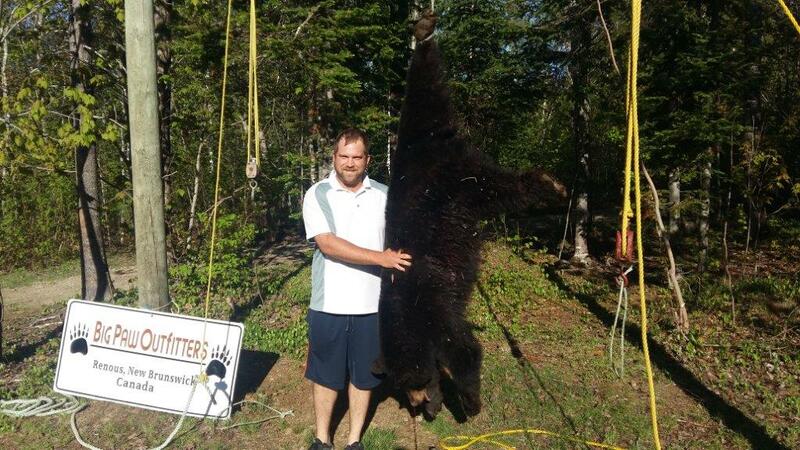 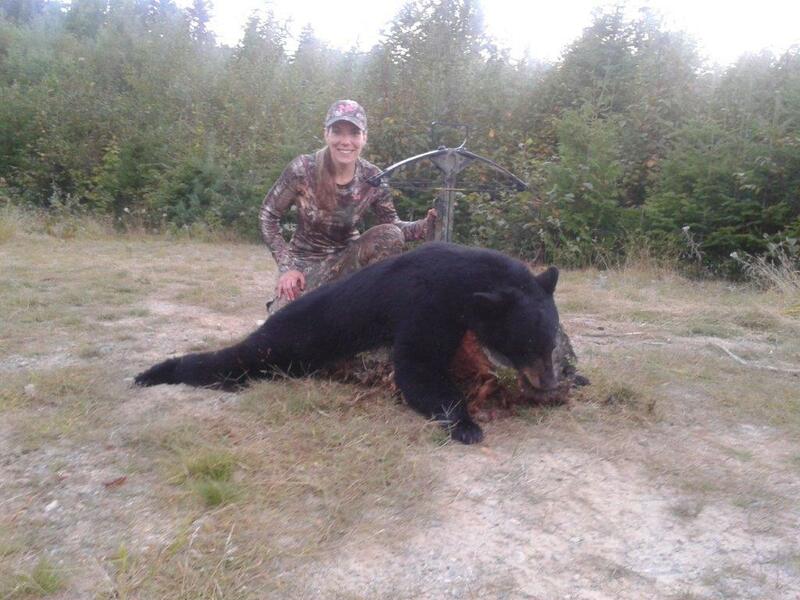 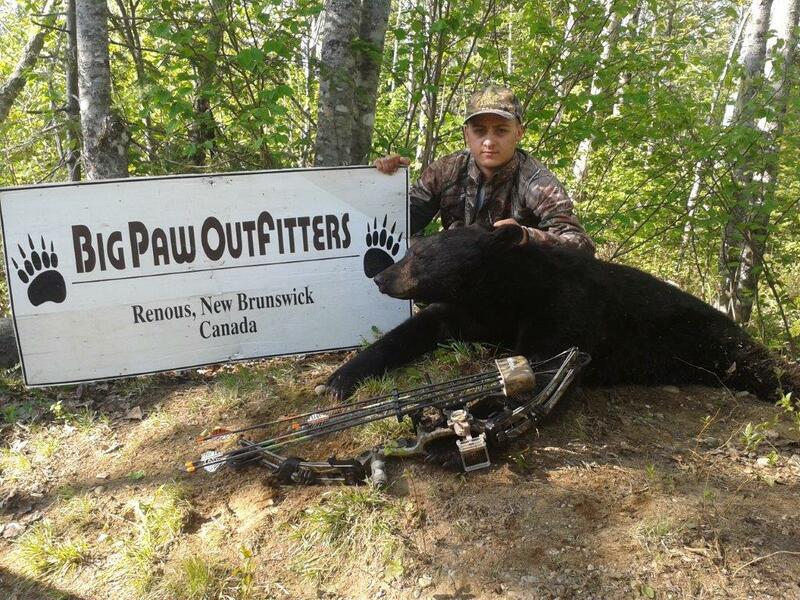 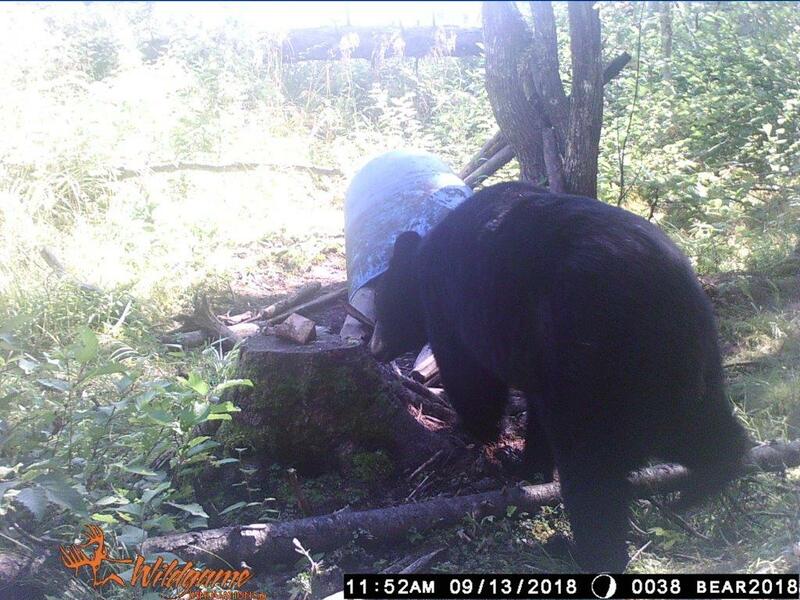 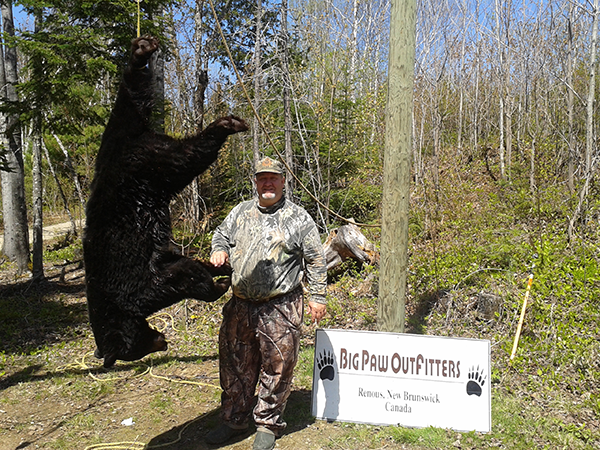 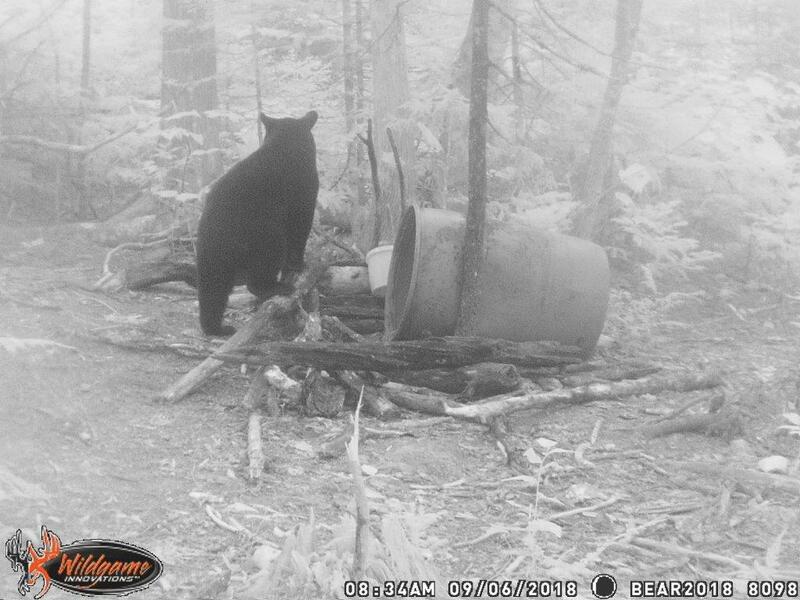 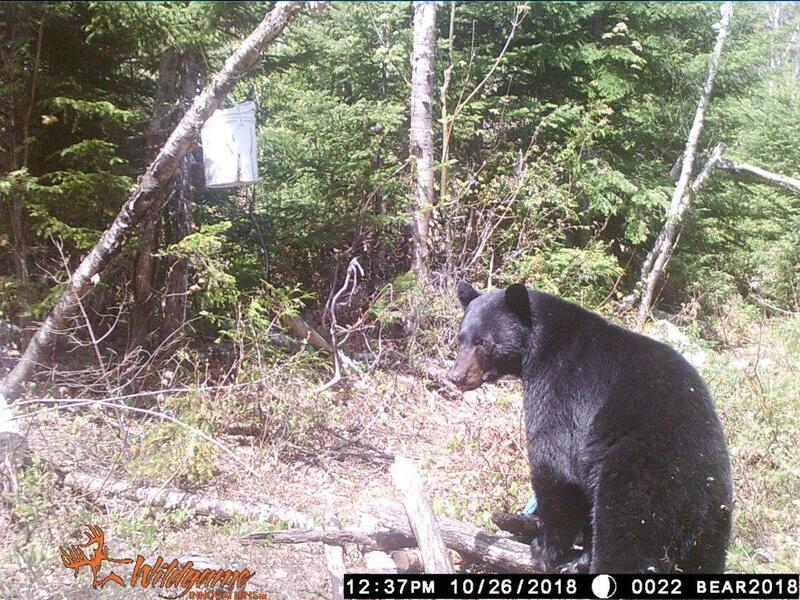 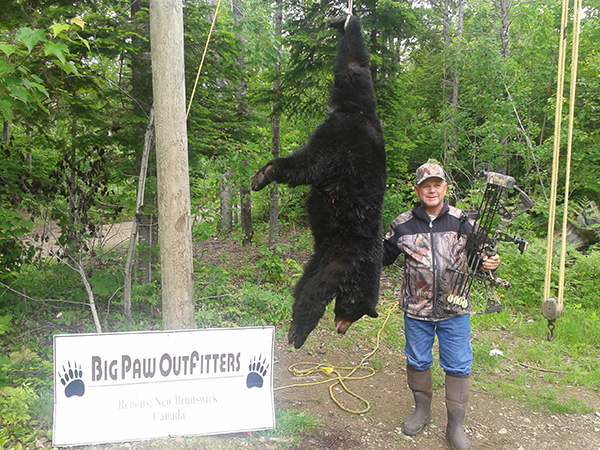 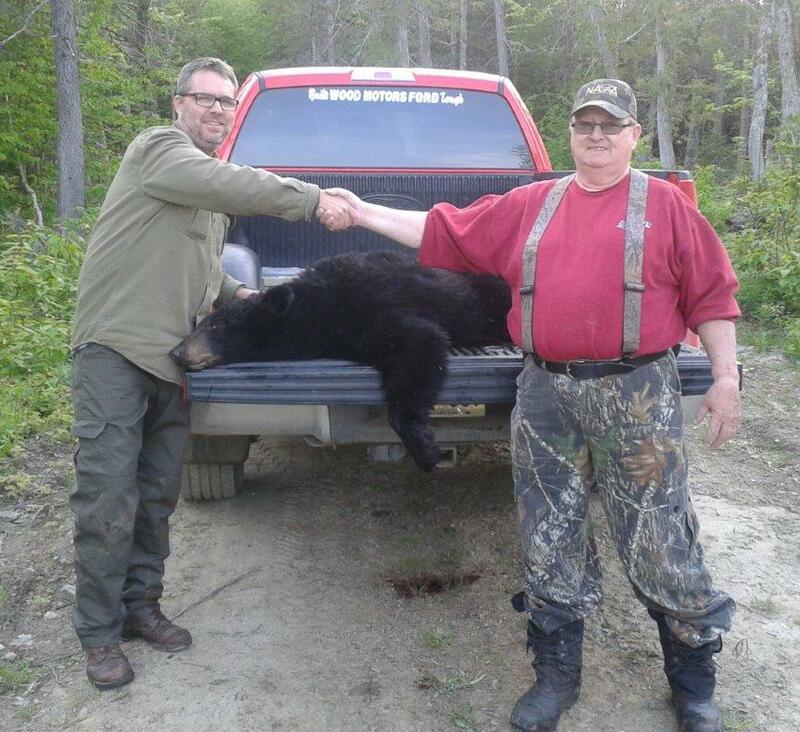 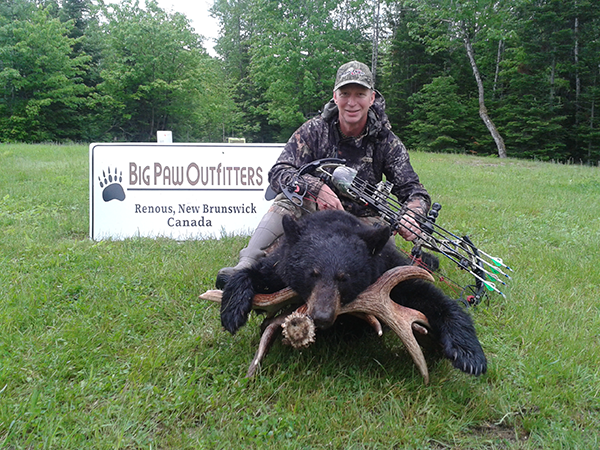 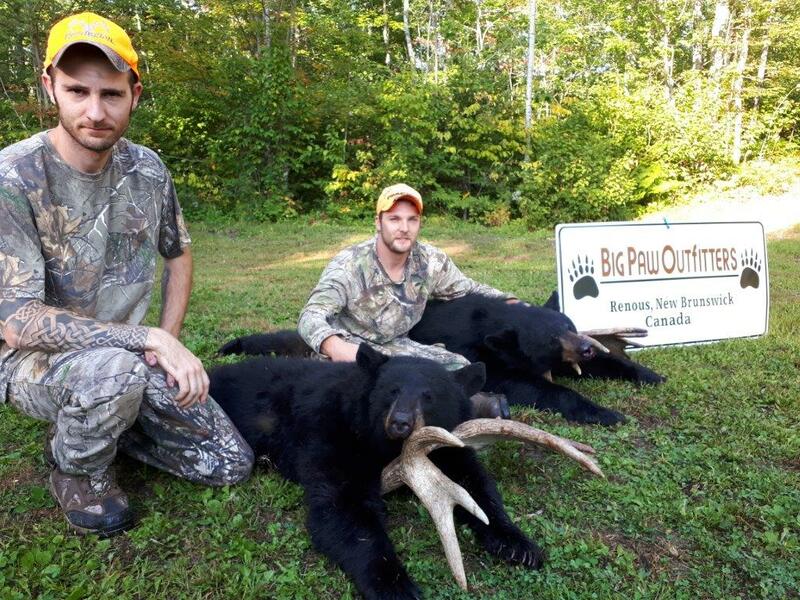 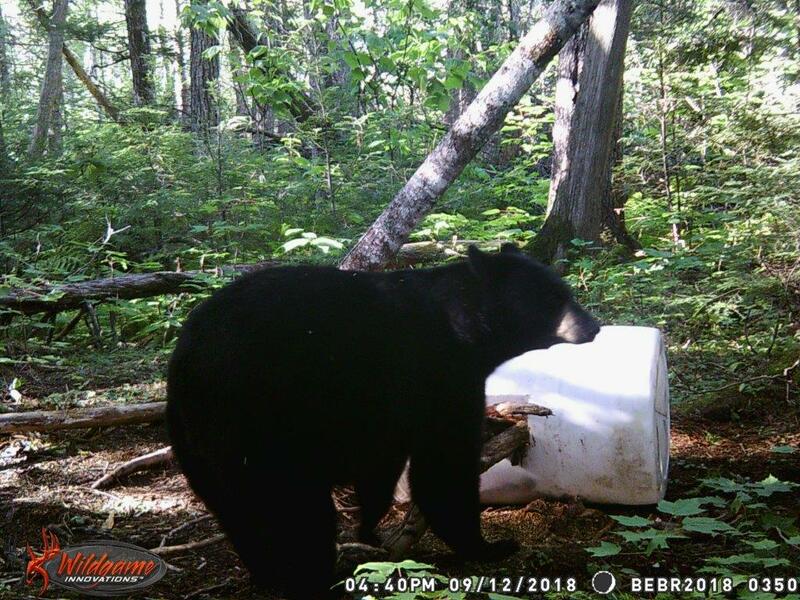 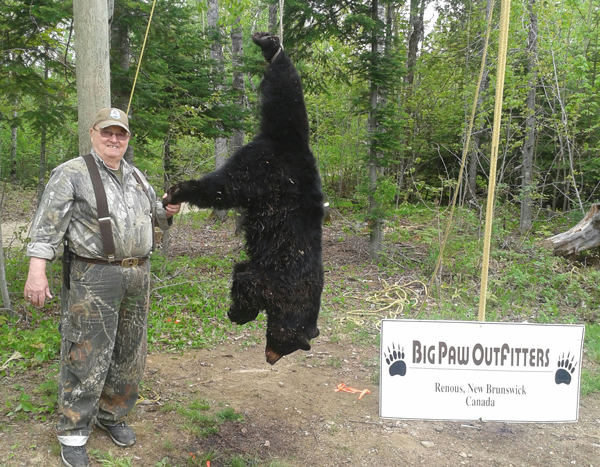 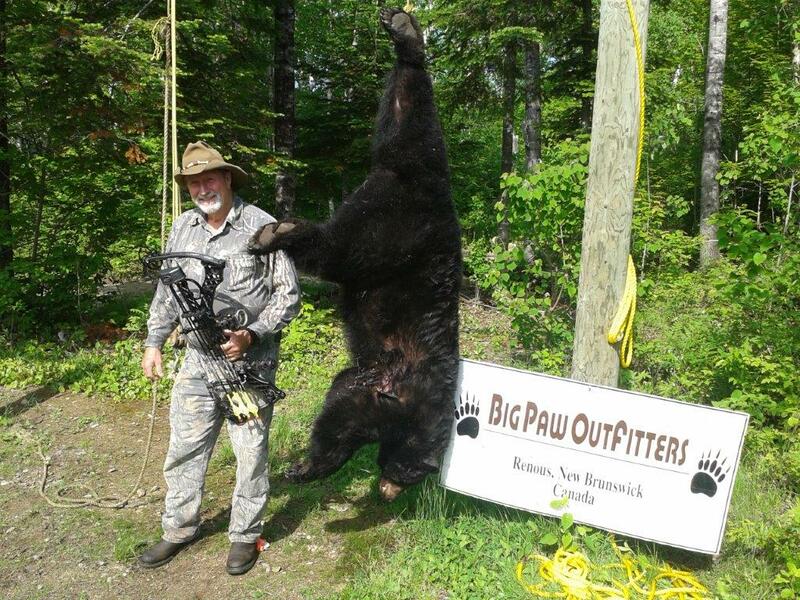 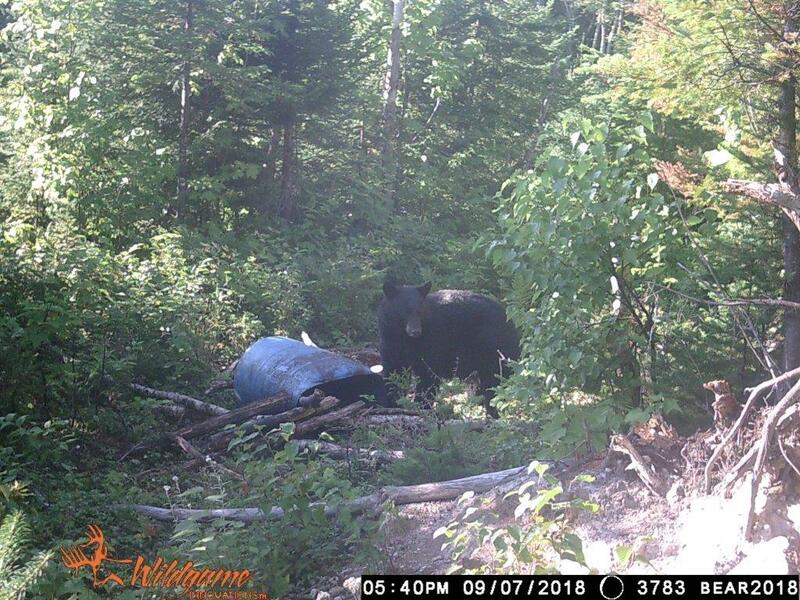 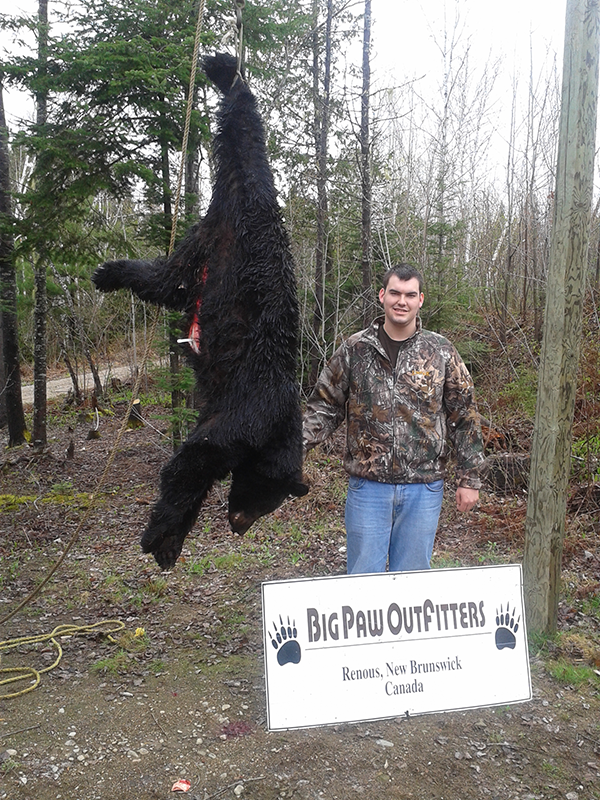 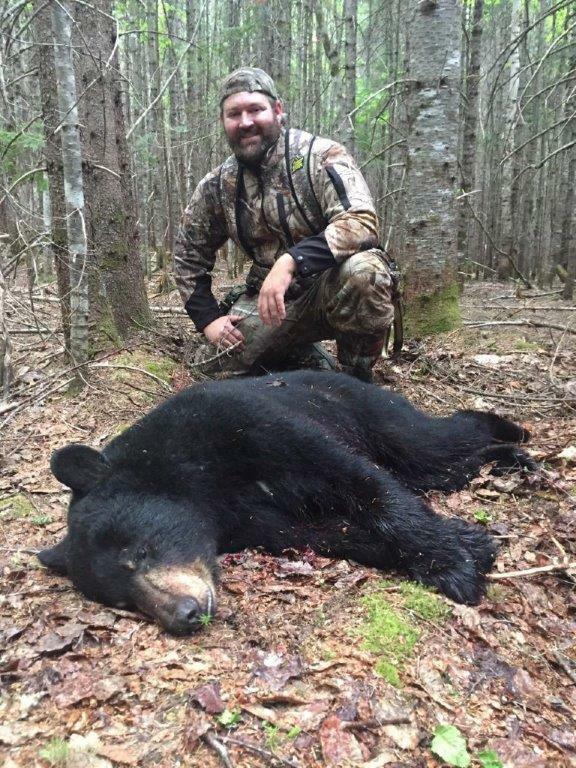 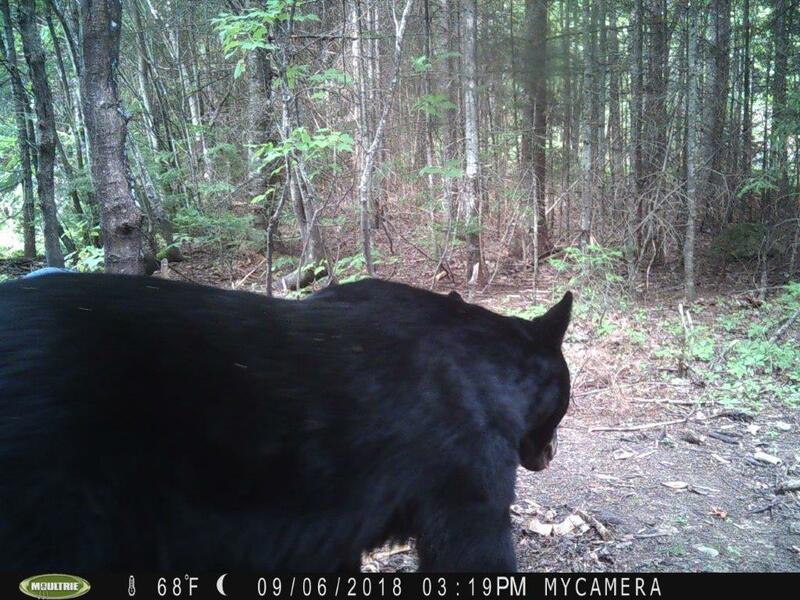 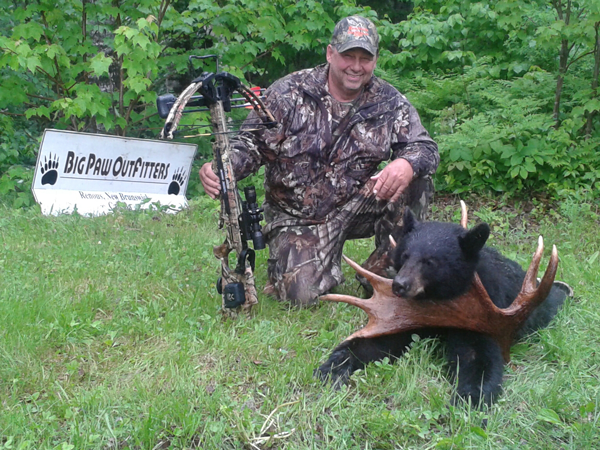 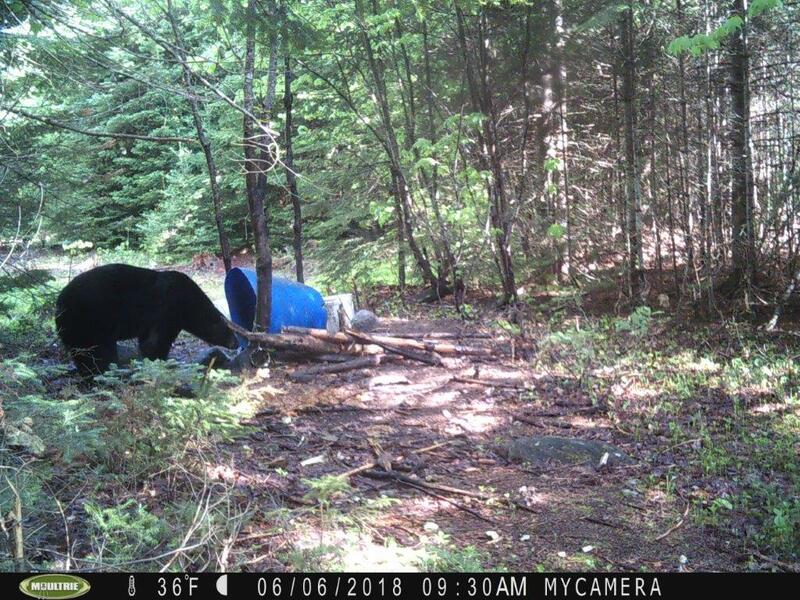 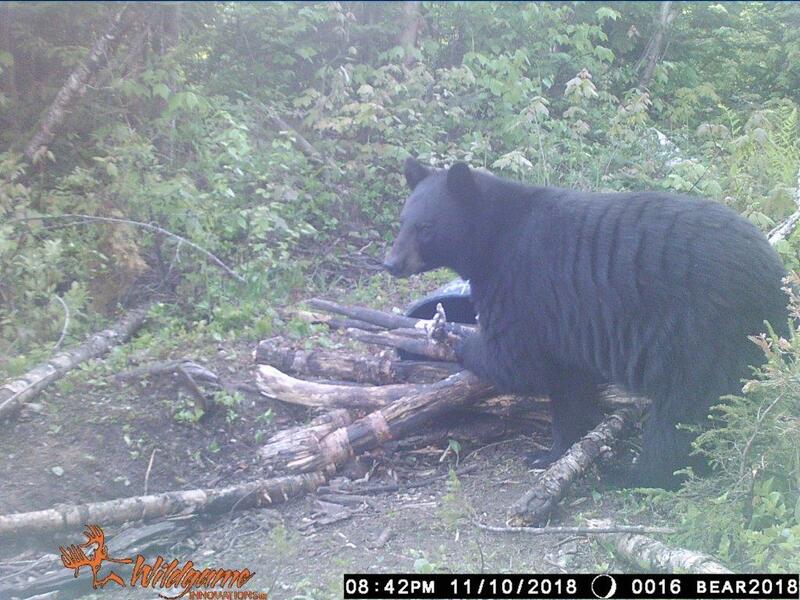 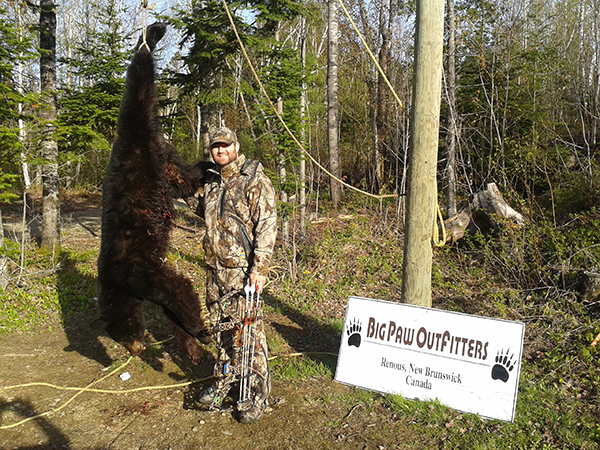 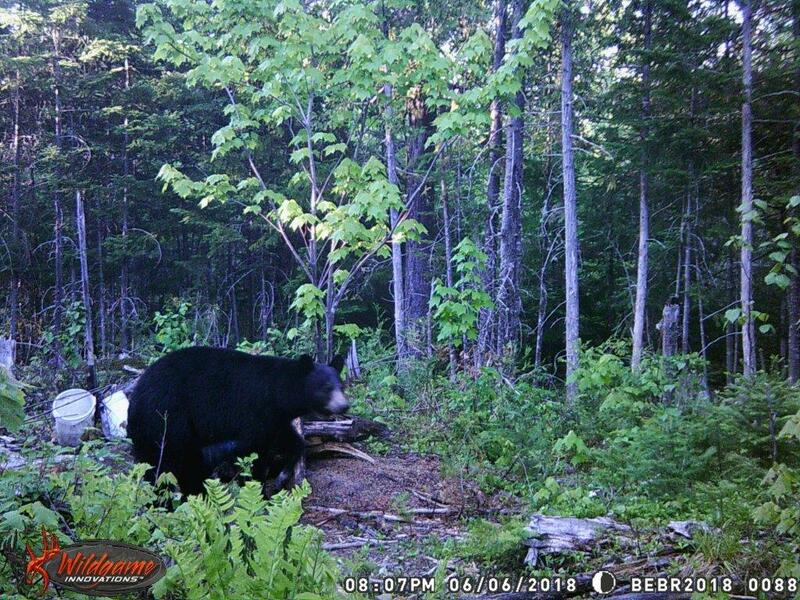 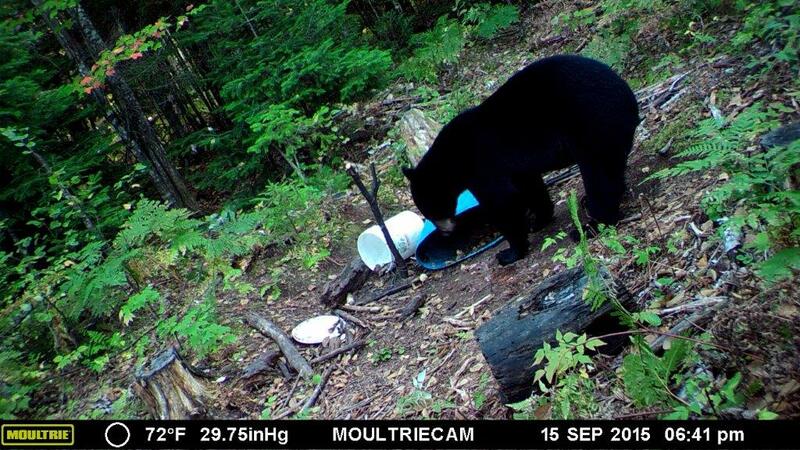 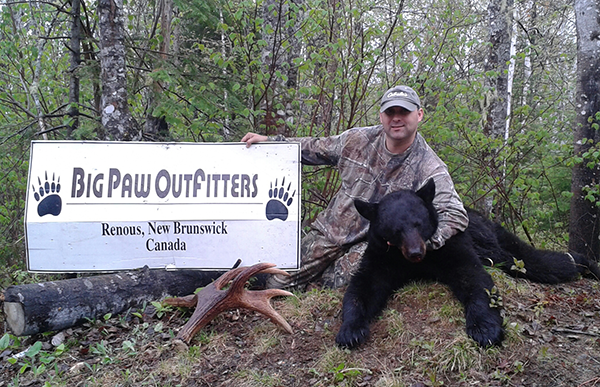 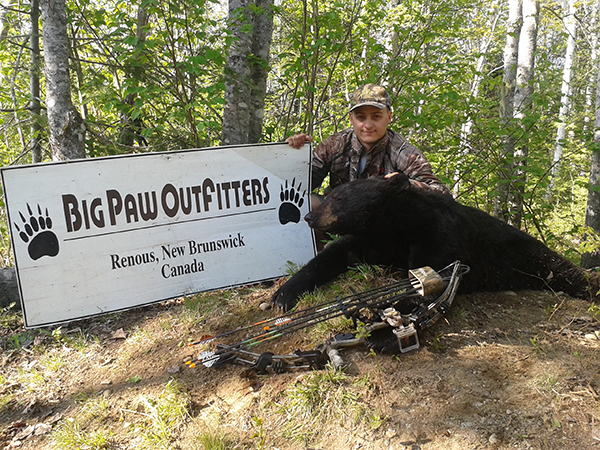 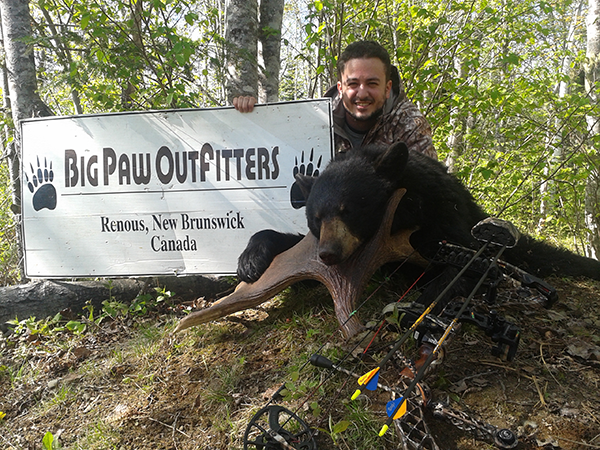 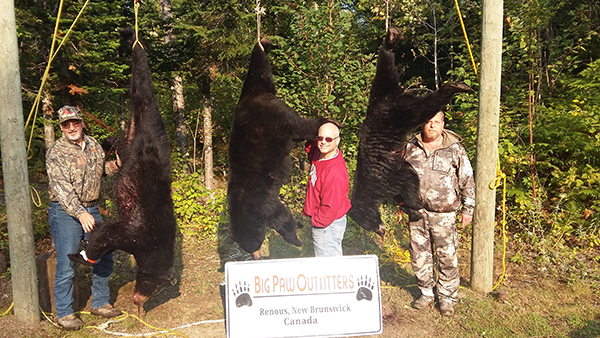 The area which we hunt is classified as Zone 7.This is not only the largest (6265 square kilometers or 3884 square miles), but the least hunted zone in New Brunswick boasting the highest black bear harvest rate per hunter. 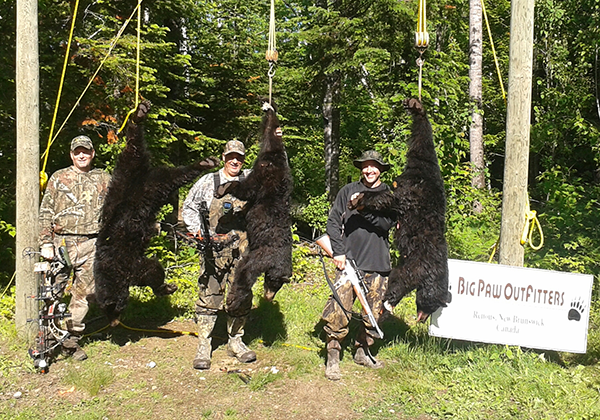 Which can lead to some outstanding trophies. 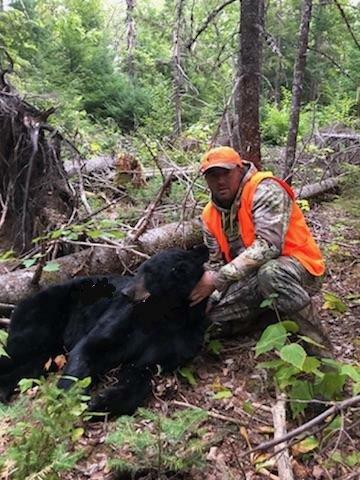 We guide a limited number of hunters per week during the bear season, so each hunter is given 100% of our effort for harvesting a trophy black bear of a lifetime. 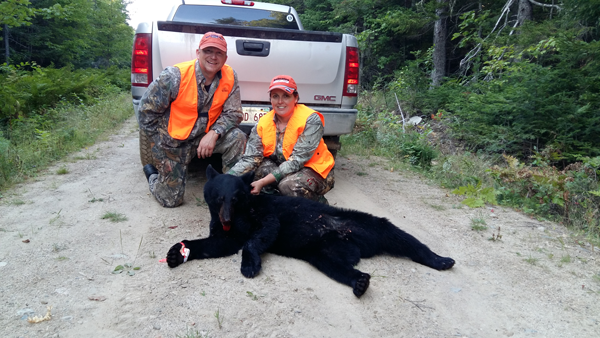 Hunter Orange is NOT required on the spring black bear hunt. 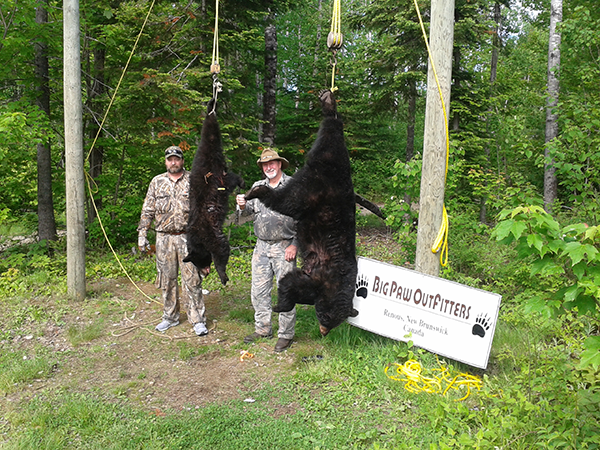 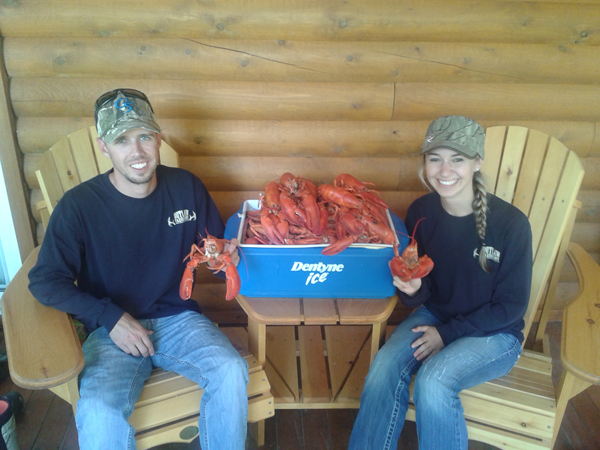 Let Big Paw Outfitters provide you with big game memories to last a life time.